As I read my post from last New Year's Eve, Time:Glancing Back and Looking Ahead, I couldn't help but force myself to look back at 2015 - a year that I will not miss. To say it has been one of the most tumultuous years of my life is an understatement. It has been stricken with loses and personal battles. 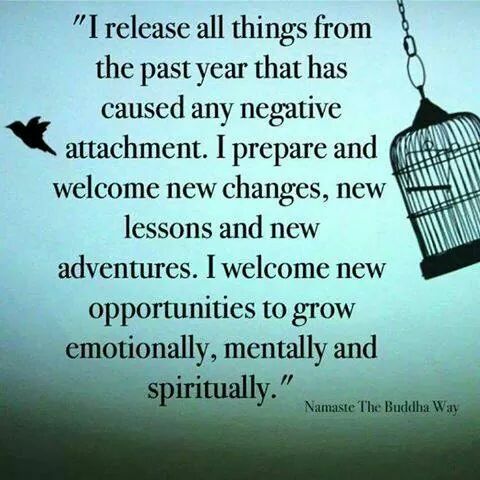 And, while I am aware that 2016 will continue to test me and allow me to subsequently grow, I am also looking forward to all the changes that the new year will bring. I have no other choice really. I either try to embrace the changes that my life is taking or I slink back into a cave and wait for life to find me. In all my life, for as far back as my teen years at least, New Year's Eve has been without a doubt the worst day of the year for me. To say I am not good with goodbyes would be an understatement. As if I needed yet another reminder of how quickly time goes, or of all the things I haven't accomplished in my life yet, today is the day, and it is thrown in my face like lemon juice poured over a paper cut, only it's not one cut, it's thousands of them. But I am going to make a change right here and now (or, at the very least try to.) For the first time in my life, I am going to attempt (see how cautious I am being) to enjoy New Year's Eve. I am going to look this night in the face and say, "F*CK YOU, 2015. You will not define the rest of my life." Phew, okay, I feel better now that I got that off my chest. Yesterday, my son and I started our marathon of The Hobbit and Lord of the Rings - an event that is spilling into today because, my God, there are only so many hours in one day and we needed to sleep sometime! I can't think of a more suitable story for me to gain strength from, more suitable characters than hobbits whose courage never "ceases to amaze me." So, I could stay in my hobbit hole in 2016 and wallow in all that I do not have or have lost. OR, I can take a lesson from Bilbo and Frodo Baggins, and I can embrace the adventure that 2016 has in store for me. And maybe, just maybe, I will find my courage, too. May you all have a happy and healthy New Year filled with love and peace.